Modern enterprises deals with a number of resources and assumes a complex, robust IT infrastructure, a number of services interacting. To keep the enterprise network alive, its infrastructure should be reliable and available 24/7. A common feature of all the enterprise IT departments is the complex nature of their intranets, providing a variety of services, most of which are for internal purposes only. The aspects of security and stability are of the utmost importance. All the possible problems should be not only detected as soon as possible, but foreseen and prevented. Apart from being very complex in structure, the intranet in such a case consists of many services relying upon one another’s availability. If one of those goes down, the whole intranet can come to a halt. Monitoring becomes a mandatory part of routine work; in case of medium-sized and bigger companies, this task can’t be efficiently performed manually. 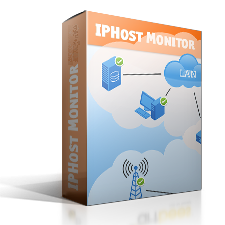 IPHost Network Monitor offers ready to use solutions for such a case; a number of monitor types and ability to specify dependencies makes it an optimal tool to provide early alerts of any detected possible or actual problem. The more complex is intranet, the more interconnected are its services, the more quick and reliable should be all kinds of alerts from monitoring. In ideal situation, alerts should be instant. Most important services are always built redundant, fail-safe, prone to a variety of factors that could cause service malfunctioning. To be sure the redundancy exists and there’s no single point of failure, all the crucial components must be supervised constantly. Alerts should also be using multiple channels of delivery; e.g., if email only is used, then local network and/or mail server failure would render such a monitoring system useless. PING (ICMP echo) monitor is the simplest one; basically, it’s a programmatic implementation of the popular ping command, used to check whether the host is alive. Although not very useful by itself, PING monitor can be used as a prerequisite, a dependency monitor, used to provide early warnings (if response time grows significantly). It can save resources used by more ‘heavy’ monitors: if the network device doesn’t respond in time, there’s no sense to run a more resource-consuming monitor on it. 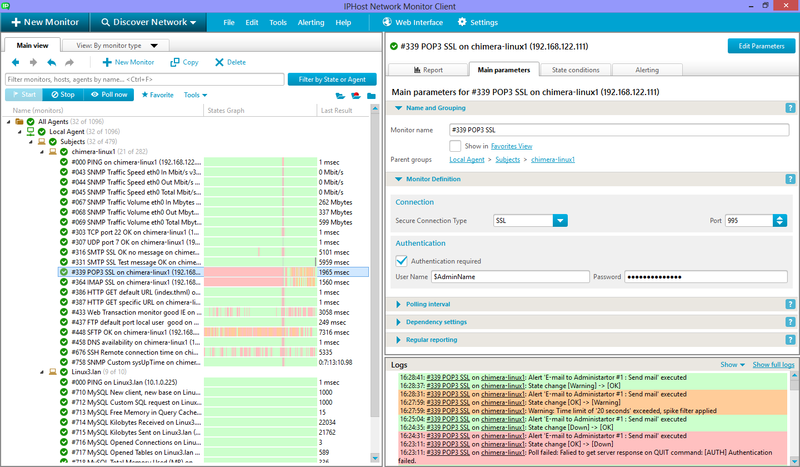 TCP monitor allows to check connection to any port expecting TCP-based connections. This is an improved version of PING monitor; the latter can be unreliable and provides only the general knowledge of host availability; but to actually test a service for presence, TCP/UDP monitors are preferable. Web Transaction Monitor is the most complex and in many cases very useful type of monitor. Basically, it emulates user’s actions on opening websites pages, entering data and submitting form data to the site. In there’s a Web interface, the Web Transaction Monitor can be the best means to check for certain data presence (i.e., open a given page to make sure the expected functionality is indeed present). 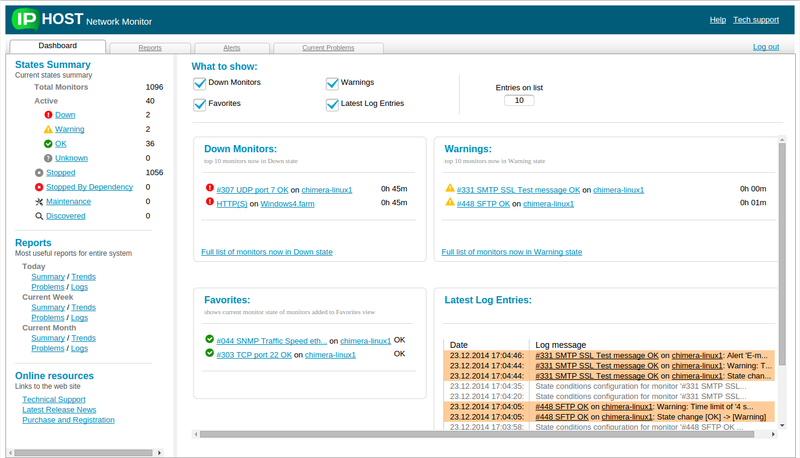 SMTP monitor makes sure there’s a SMTP (outgoing mail server, used to send email messages via) server present. The monitor can check both insecure/STARTTLS or secure versions of SMTP and perform authentication and, if required, sending a test message to verify the email is actually sent. Database monitors (ODBC, MySQL, MSSQL etc) allow to connect to a database server and run a SQL query. This can be a universal checking tool in cases when most data is stored in databases. For example, Web-based mail clients can be checked for login attempts; databases can be checked for certain data structure presence and so on. Note that the collection of monitor types is just a test one; in any real-life case another monitors set could be more relevant and useful. Note only that low-level monitors (PING, TCP/UDP) can and should be used as dependency monitors to prevent more resource-consuming monitors from being run and to provide early alerts about possible problems.